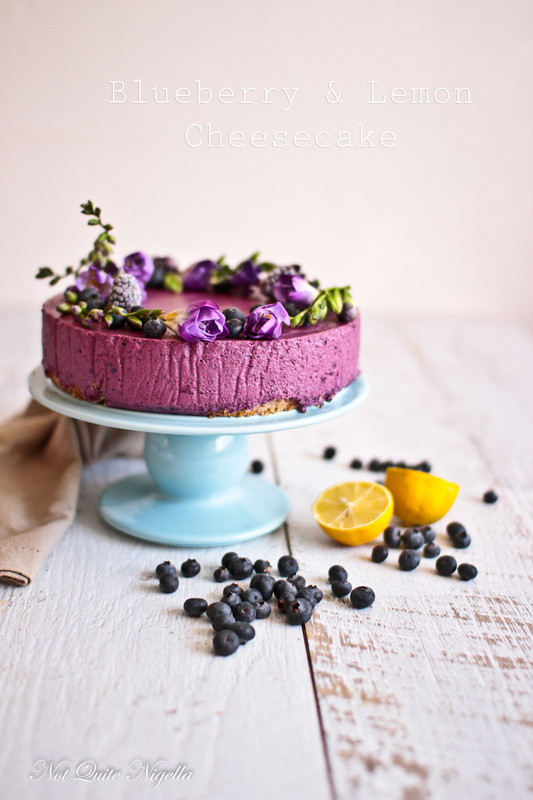 The colour of this easy no bake blueberry and lemon cheesecake has to be seen to be believed! 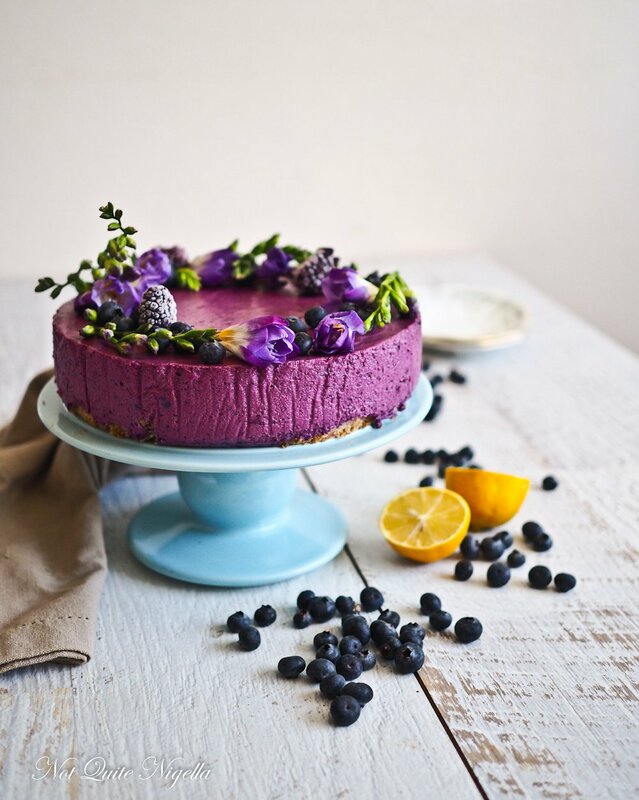 Learn the secret to getting a vivid purple colour in a cheesecake without having to resort to colourings. This cake looks like a lot of effort but is super simple and not too sweet! Her name is Deborah. 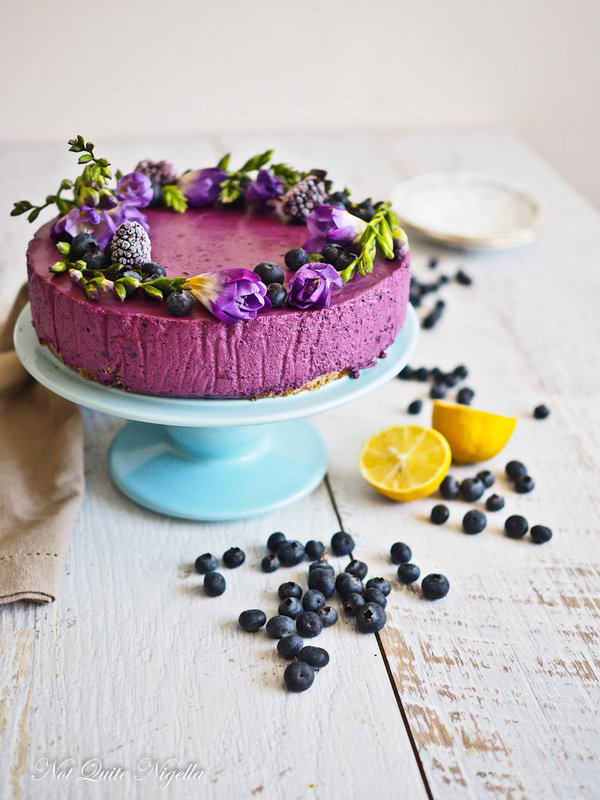 The key to getting the bright, deep purple colour in this cheesecake is to roast the blueberries until their juices run out. You can use frozen blueberries too because fresh blueberries can be very expensive here. 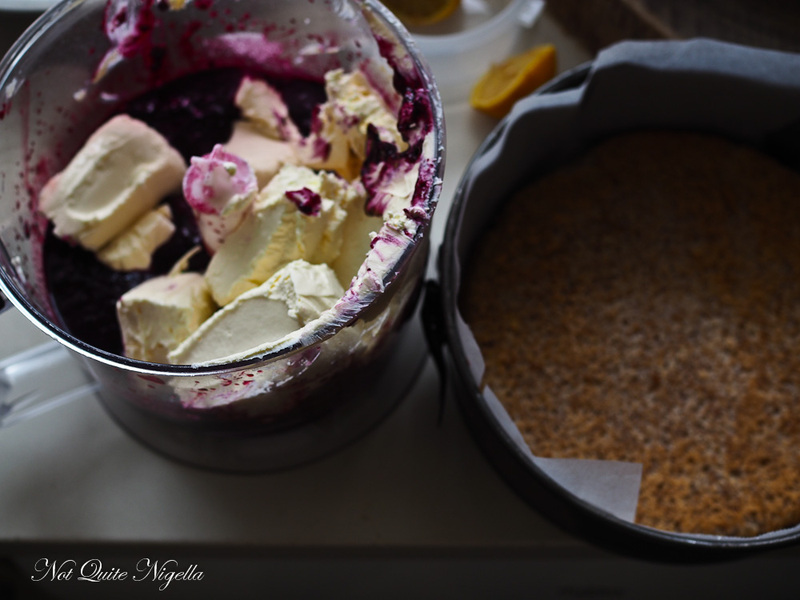 All you need then is some cream cheese, ricotta, sugar, vanilla and lemon juice and you have your deep purple cheesecake filling that is as light as a feather! Speaking of bribes, I have told you about the recent situations in Peru in which I thought that Peru was trying to kill me (the anaphylactic shock, the hotel fire (that's another story)). Well they say that trouble comes in threes and I am here to attest that it really did while we were there. On the night before our tour started, I went to pick up two guests from the airport. Everything was going well, I just wanted them to get to the hotel with plenty of time to rest for the next day. They were the loveliest couple called Viv and Peter from South Africa. We turned one corner and there was a traffic stop where they asked the van to pull over for a moment to check something. Papers were handed over, my Spanish (which mainly extends to understanding food Spanish) failed me but I could read the gestures as the driver and Peruvian guide got a touch more irritated. I heard the word "turista" or tourist a lot and they pointed back at us a bit. "Guys, we have to follow them back to the police station," Pablo the guide said. I was mortified. This was the introduction to Peru for our guests who were remarkably calm and very good natured about it all. We followed the police motorbike to the station where it became obvious that the magical words "turista" meant to the police that the driver and guide would pay quickly to make the situation go away. Our guide called his company to authorise a bribe and within 15 minutes, we were on our way with our lovely guests in tow. In this case, I don't think cake would have sufficed, only cash! So tell me Dear Reader, do you find cooking for one less exciting than cooking for others? And have you ever had to pay a bribe? Step 1 - First make the dacquoise base (you can also make this a regular cheesecake base using cookies and melted butter). Line a 20cm/8inch springform tins with parchment on the base and sides and preheat oven to 180C/350F. Whisk the eggs and sugar until quite thick and pale-about 4-5 minutes, you don't want it too runny. Then fold in hazelnut meal, flour, butter and lemon zest. Spread into tin and bake for 20 minutes or until lightly toasted in colour. Step 2 - Preheat oven to 200C/400F and line a Swiss roll baking tray with parchment. 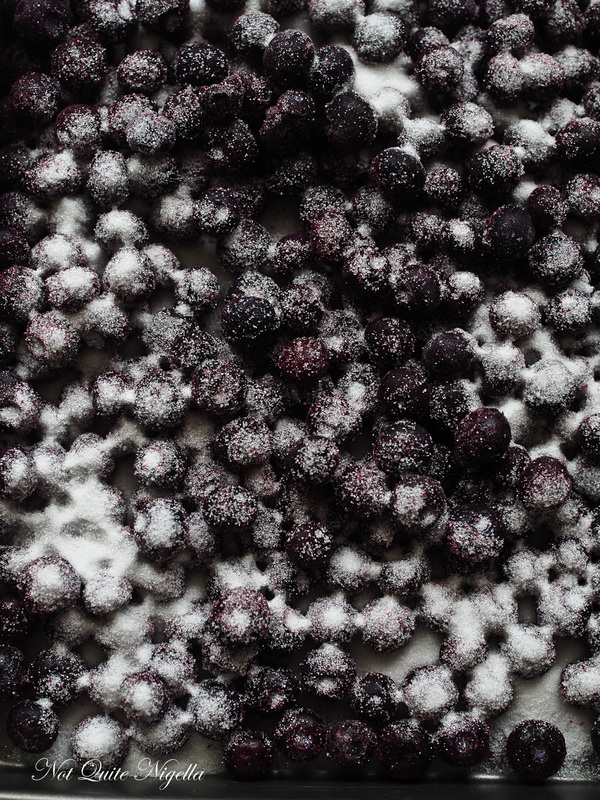 Place the blueberries on the tray and sprinkle with sugar. Roast for 15-20 minutes until the juices run out. Soak gelatine sheets in cold water for 5 minutes and then squeeze out excess water. Step 3 - Puree the hot blueberries and add the squeezed gelatine sheets into it and stir to melt. Then add the cream cheese, ricotta, sugar, vanilla and lemon zest. Pour into the prepared tin over the base and allow to set for 4-6 hours or overnight. 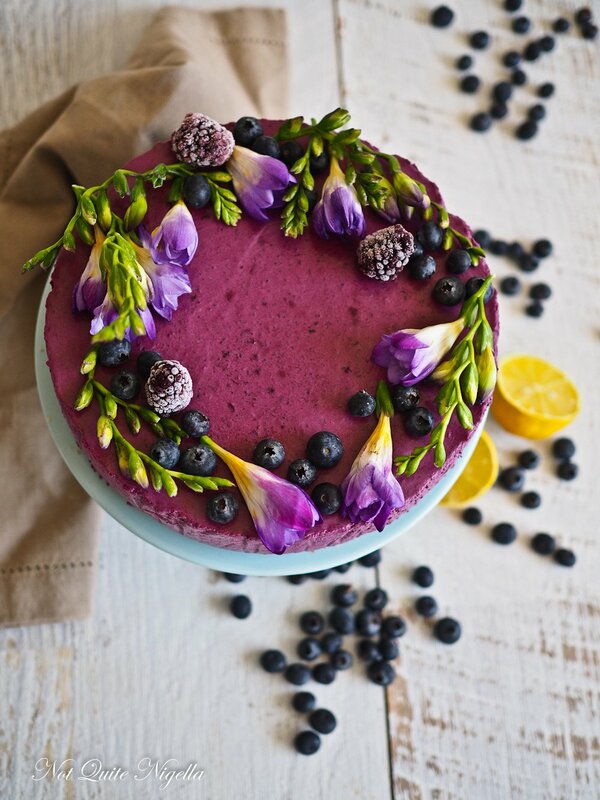 Step 4 - Decorate with purple freesias and fresh blueberries. 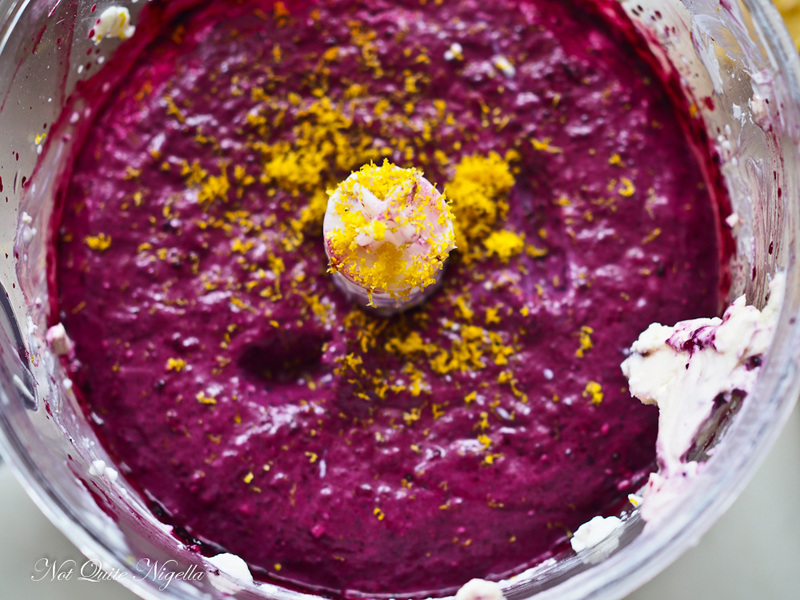 recipeNo Sweat Easy 3 Ingredient Blueberry Cheesecake! recipeOh You Little Tart: Passionfruit & Lemon Mini Cakes! 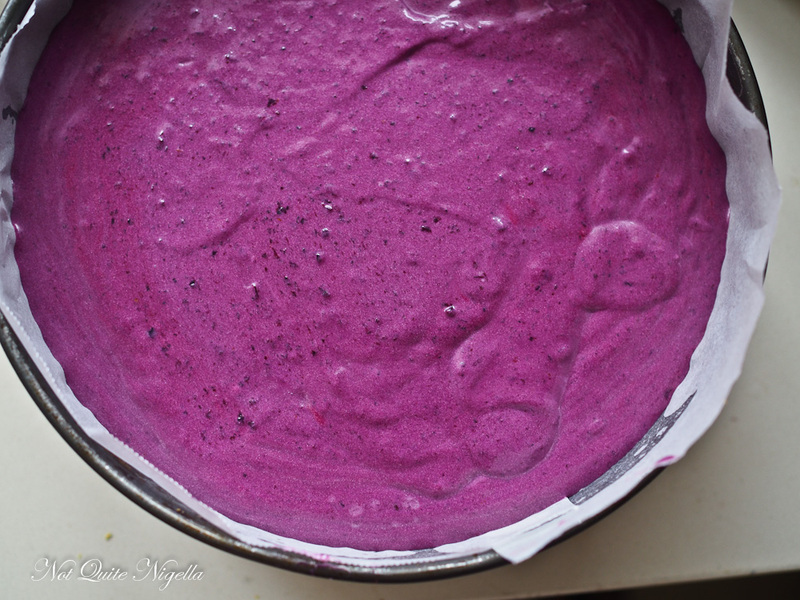 recipe No Sweat Easy 3 Ingredient Blueberry Cheesecake! recipe Oh You Little Tart: Passionfruit & Lemon Mini Cakes!